Describe the role of pumps in a hydraulic system. Describe the role of prime movers in a hydraulic system. Define flow rate. List the formulas used to calculate flow rate. 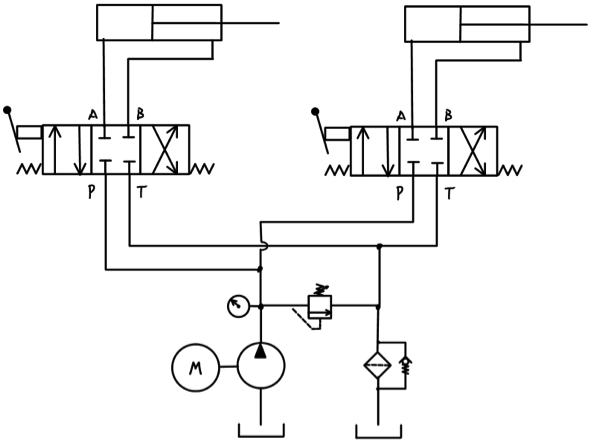 Discuss two methods the prime mover and pump combination can directly influence flow rate. Discuss how a system can control flow rate given a fixed displacement pumps operated at a fixed rotational speed. Discuss the purpose of the check valve bypass for a flow control valve. 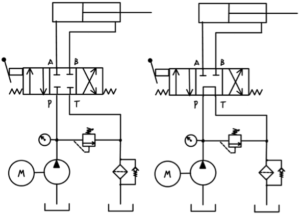 List the characteristics of a positive displacement pump. Compare and contrast this with a non-positive displacement pump. List the sequence of operation of a positive displacement pump. Comment on viscosity requirements, conditioning needs, and cleanliness standards for positive displacement pumps. 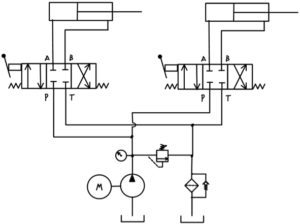 Describe why a tandem center directional control valve would not work for this circuit. 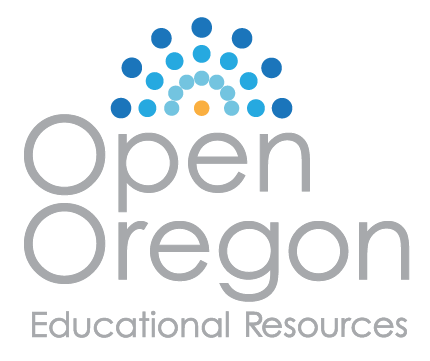 Describe why displacement ordinarily decreases at higher pressures. Describe why rotational speed ordinarily decreases at higher pressures. 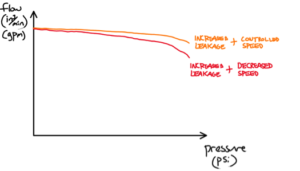 Describe why flow rate ordinarily decreases at higher pressures. Describe this family of curves. Given a pump with a fixed displacement of .35CIR at ideal conditions, calculate flow rate in gpm if the pump was driven at exactly 1800 rpm. Describe this family of curves for a pump rotated at a nominal speed. 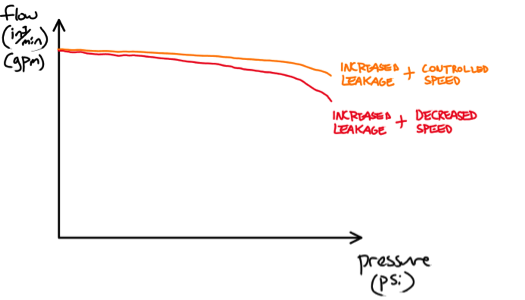 Comment on how actuator speed is influenced by increased pressure requirements. 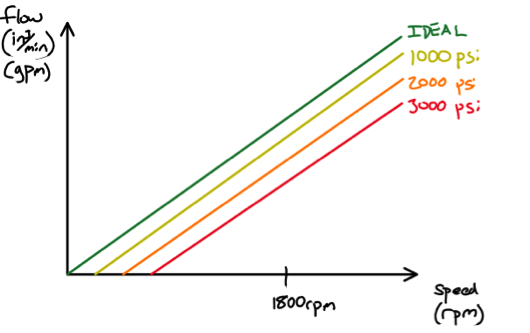 Given a pump with a fixed displacement of .35CIR at ideal conditions decreased to .33CIR at 1000psi, calculate the volumetric efficiency at 1000psi. 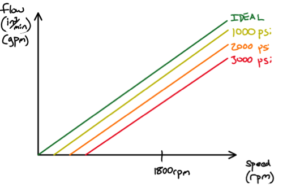 Describe why pump manufacturers specify drive speed, fluid properties, and pressure ranges. Write the formula used to calculate hydraulic power when pressure is expressed in units of psi, flow rate is expressed in units of gpm, and power is expressed in units of hp. Given a pressure of 1500psi and a flow of 2gpm, calculate the hydraulic power output of the pump. Given this output necessitated the prime mover supply 2.4hp of mechanical power, determine the overall efficiency of the pump. List three common positive displacement pumps employed in hydraulic systems. Comment whether the pumps are fixed or variable displacement. Differentiate between fixed and variable displacement pumps. Discuss the advantages and disadvantages of variable displacement pumps. 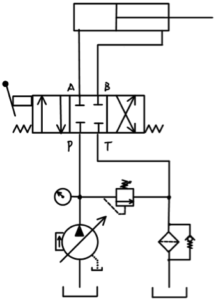 Describe how the pressure compensated variable displacement pump prevents the main pressure relief valve from actuating in this circuit when the actuator reaches the limits of travel or when the valve is placed in the center position. Define firing pressure. Describe why the main pressure relief valve must be above the compensator setting. Explain high pressure standby. 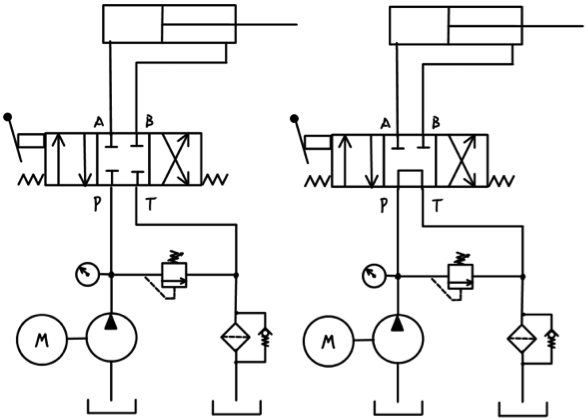 Describe the advantages and applications for circuits using pressure compensated variable displacement pumps. Describe how a shuttle (OR) valve works. 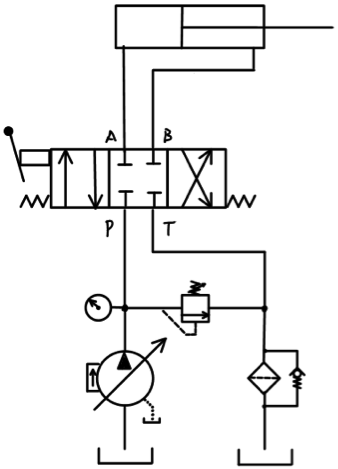 Draw the schematic symbol. Describe a load sensing operation making use of a pressure compensated variable displacement pump. Define cavitation and identify possible sources of cavitation. Define aeration and identify possible sources of aeration. Define pseudo-cavitation and identify possible sources of pseudo cavitation. Differentiate between cavitation, aeration, and pseudo cavitation.